People in Orkney say they have been "heartbroken and appalled" by vandalism at a Royal Oak memorial garden. More than 800 crew died when the battleship was torpedoed in Scapa Flow in 1939. 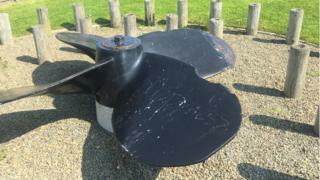 A memorial was established at Scapa beach overlooking the site, but a propeller in the garden has had graffiti scratched onto it. There are now plans to involve local primary schools in caring for the area, as part of a major revamp. Heather Taylor, whose father Charles Millar set up the memorial, told BBC Radio Orkney he did it to give the families of those who died somewhere to "reflect on their losses". She said the graffiti was "mindless", and the memorial garden was "not a playground". People visiting the site said the vandalism was "disgusting". Tom Brunton, from Macmerry near Tranent in East Lothian, served in the RAF. He said: "Why do it? They're doing it to war memorials as well. It's ridiculous." And his daughter, Pamela Brunton, who lives in Kirkwall, said: "I wouldn't like to be the parents of the children that were involved. I would have skinned my kids alive if I thought one of them had done that." Image caption Father and daughter Tom and Pamela Brunton said the damage was "disgusting"
Local councillor Gwenda Shearer said there had already been moves to improve the memorial site. "I had already arranged to come out here and it coincided then with what happened," she said. "So I came and saw the propeller. Then had a look in the building. And, I must admit, I was disappointed with what I saw. "It definitely needs some reconstruction into a place where people can come and reflect on what we know is, of course, a significant piece of Orkney's wartime history." Heather Taylor's husband Phil said involving schoolchildren in caring for the site should teach them "respect for the area". "If they come and have an input into it, they're more likely to look after it and not do any of the damage that we see here today," he said. That idea has already won support from Clare Gee, from Orkney Islands Council cultural services. She said: "I'm certainly very happy to take that (idea) back to my colleagues in the education service to see if there's any ability to get them involved." She said: "Certainly when we had really big projects last year, like the commemoration of the centenary of Jutland, the schools were involved. Every single school was involved. "And I think we can certainly move forward with that." Heather Taylor said she hopes that idea means some good can come out of the damage to the site her father founded. "It's nice to see that somebody is actually taking note now, and maybe it will go forward, and see progress. "So the Royal Oak survivors can come here and enjoy the views, and show respect for the lost ones they've left behind." An online crowdfunding appeal to repair the damage raised its £500 target in less than 24 hours. Orkney's Community Justice Partnership has offered the services of offenders sentenced to carry out unpaid labour to do the work.